20 acres of woodland. 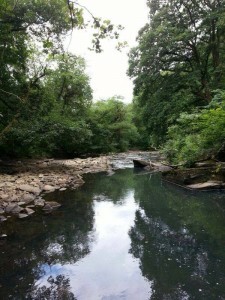 The river Dulais borders the west side of the woods and part of the old single track Neath & Brecon railway borders the east. You cannot take any vehicle into the woodland but you can park near the gate and you walk in from there. You probably wouldn’t need to walk more than 100-200 metres to find suitable camping spots but it’s worth thinking seriously about what you really need to bring. Small camp fires are fine*, but strictly no air weapons, bows or trapping. Any kind of tents are welcome together with hammocks, tarps. We ask people to leave the place clean and tidy. Facilities – We have male and female toilets (portaloo type), free hot shower, separate washroom and access to hot water, fridge, kettle, microwave, sockets for charging devices. You will be a 3 to 4 minute walk from the woodland to the facilities dependent on precisely where you choose to set up camp. *There maybe certain pronged dry weather conditions which would result in a suspension of camp fires owing to the safety risk .